The latest in a series of school projects completed by PHASE3, landscape works at Ellenbrook Secondary College on behalf of the EDUWEST JV are now complete. The positive feedback received from the team has proven again that we are fast becoming Perth’s premier school specialist for landscape construction. Comprising over two and a half hectares of combined external hard-scape and soft-scape works worth over $1.6M, we'd like to congratulate our team on delivering another incident and hassle-free build and supporting Badge Perkins to deliver a great project. 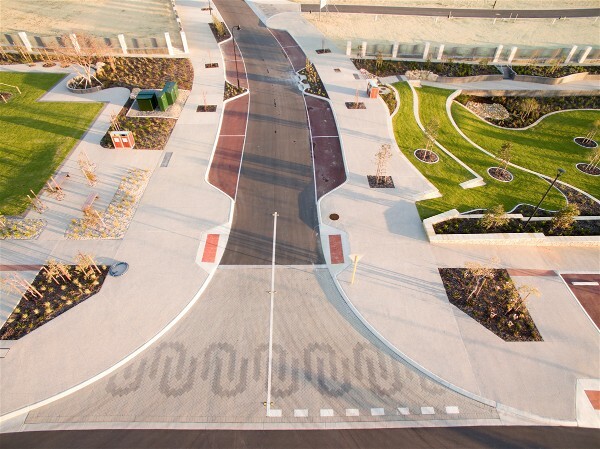 It's been over a year since the completion of the streetscapes and parkland and we are proud to see it's thriving. Landcorp and the design team have created a beautiful coastal address, waiting to be enjoyed and explored by its new community. PHASE3 Landscape Construction, in conjunction with Wormall Civil, were awarded the construction of the Cockburn Coast Stage 1 (Shoreline) project in North Coogee, working with landscape architects URBIS, Wood & Grieve Engineers and NS Projects to deliver the project for LandCorp. Stage 1 involved extensive civil works and remediation of the site, culminating in high quality streetscapes and the creation of 1.6 hectares of public open space including a nature play area, shade structures, barbecue facilities, sporting and play equipment, bespoke furniture and public art. The project was delivered to the highest quality, on programme and on budget. 2600+ sqm UrbanStone large format paving and edging. Rock-salt texture in-situ concrete feature paving. In-situ exposed aggregate concrete stairs, with granite nosing and UrbanStone tactile indicators. Omni-grip sports surfacing with painted line-type artwork. Interpretive feature granite laser-etched paving inlays. Limestone boulder seating and limestone pitching. Stabilised gravel paving and soft-fall surfaces. Board-formed off-form concrete retaining and blade walls. Limestone rubble clad block-work retaining and feature walls. • Fabrication & installation of custom curved gabion retaining and feature walls. Custom board-formed off-form concrete & steel shade structures, including Pic-Perf interpretive steel screens and board-formed concrete and timber seating. For more information please contact Phase3. WGV at White Gum Valley is a project that not only showcases current best practice but is pushing the boundaries and exploring new possibilities for urban water management. WGV demonstrates a holistic approach to water management, incorporating water sensitive design in storm water management, delivering water for garden irrigation from a community bore and encouraging water conservation in every building. WGV is the subject of a comprehensive research program that will assess the innovations being developed. The urban development industry will build on the research and innovation to further advance urban water management in our towns and cities. Congratulations to the WGV at White Gum Valley team. Phase3 undertook all the landscape construction works for the estate as well as the GEN Y demonstration house within the estate. We currently responsible for maintaining the estate gardens. We are very pleased to be recognised for our work in this a project. Many thanks too to Josh Byrne & Associates, Landcorp and UDIA. If you would like to view our work, please feel free to visit the project. Click here to view the map. Phase Three has been very proud supporters of this worthy event for many years. "The Goal is simple: To give these brave kids a day to feel like the lucky ones for a change." This has become an annual event made possible by the WA business community that provides magical Christmas memories for WA's bravest families. Highlights from the 2016 Party. Spring is in the air, and nowhere more apparent than in the gardens and parks of Perth and throughout the State. Last weekend we took our kids out to York which was holding its annual festival. On the way we stopped in at York Olive Oil which had a beautiful display of everlasting daisies all out in colour with the swathes of whites, pinks and everything in between. Incorporating everlastings in your garden can provide a real pleasure when they come out in full display. It is also a great way to get the kids involved, sowing them a few months before, watching and waiting to see them grow. They are best planted in autumn in a nice open, sunny position. Ensure the soil is moist prior to planting . They work best when planted on mass in larger garden beds. A drive through Kings Park at this time of year shows great examples of this. Everlastings appear often in their roundabouts and roadside gardens. Kings Park Wildflower Festival winds up in the 30th September so there is still time to visit the park and participate. Another gem of a spot in the Perth Hills is Araluen Botanic Park. I grew up in the hills of Perth and remember visiting the park many times with my mother who was a keen gardener. The park is renowned for its Tulip gardens which display from late August to Mid September. What sort of garden would you prefer? Would you prefer a garden that is full of plant life and diversity that requires hours on end of pruning, clearing and weeding to keep it in a maintained condition? Or a garden devoid of plant life, which requires little to no maintenance but as a result is hard and sterile? We find the answer for most of our clients’ lies somewhere in between. Most of our clients’ lead busy and sometimes stressful lives, and often request gardens than are easy to maintain but also require some acts of ‘gardening’ which can provide a multitude of benefits. Often a small amount of nurturing can both bring stress relief, enrichment and satisfaction. Children can also benefit from being involved with the garden and it is a great way for them to connect with nature. Just a simple act of planting a plant, watering it every day and watching it grow can provide a huge benefit to developing a child’s connecting with nature and empowering a sensibility to nurture and be curious about the natural world. We thought we would share with you are few of our landscaping design tips which helps to reduce the maintenance load for our clients. For obvious reasons the size of a garden bed will impact on the amount of garden to maintain but good species selection can minimize this. Generally it is helpful to provide a depth of garden at around 1m so you can layer planting to create depth and contract in foliage. Sometimes this is not appropriate such as in a small walled courtyard space, a narrow garden bed of around 300mm at the base of the wall can create a green transition which can go a long way in breaking up hard surfaces. One thing to consider in this case is the depth and size of the footing of the wall because often it will encroach into a lot of the adjacent garden and not provide any soil space for plants to grow. Again, correct species selection can assist in these situations. Keeping the garden beds small and raised can make looking after them a lot easier and manageable. Another form of this is a vertical garden system were the planting tubs are smaller and stacked, they are great for tighter spaces. Trees are often fairly low maintenance but care must be taken to ensure that they are appropriate to the space. Tree section is critical in a typical residential landscape. Evergreen trees can be more beneficial as the usually don’t drop many leaves but often this may not be desirable if they are on the north side of a house as they can block winter light into the home which can make a big difference for providing passive warmth in the colder months. Fully deciduous tree obviously shed a lot of leaves but there are many varieties which are only partially deciduous so sometimes a balance can be found. Limiting the number of plant species will help make your garden look more maintained. Find shrubs or groundcovers you love and plant them in mass, repeat each mass group planting a few times so the landscape looks cohesive. This creates a simple planting palette that looks serene and requires minimal upkeep. Planting a shrub that grows to 3m when you only want it to fill a 1m space is an example of the wrong plant in the wrong location and increases the amount of time you will spend pruning it to keep it the size you want. This mix will help reduce watering, suppress weed growth and reduce maintenance whilst requiring less watering. 7) Hire someone to do it for you! Phase3 Landscape Construction offers a full service residential landscaping and service to clients in the Perth area. If you are interested in using our services, please feel free to contact us now. "Stretching from South Beach to Port Coogee, Cockburn Coast Redevelopment Area will ultimately become home to some 12,000 people in 6,000 homes over 15 to 20 years, as the project develops. The redevelopment will rejuvenate 98 hectares of under-used area and will be split in to three precincts, Robb Jetty, Hilltop/Emplacement and the Power Station, each with its own unique design and offering" Landcorp 2016. We are delighted to announce that Phase3 Landscape Construction were awarded 5 industry landscaping award on Friday night. The LIAWA Awards of Excellence for 2016 were held at the Frasers State Reception Centre, Kings Park and were hosted by MCs Matt and Kim, of TV hit series Matt & Kim to the Rescue. Finalist - Designer – Residential – 250sqm to 500sqm - Project William Rd. Many thanks to our in-house team of designers and landscapers. 2016 is turning out to be a great year for Phase3! Creating and manipulating space is a key part of successful landscape design, particularly with ever diminishing plot sizes and the need to create exterior spaces that can provide for all requirements of modern living, whether that be entertaining, family play or a quite place to relax and get away from it all. Here are our 10 top tips for creating good beautiful garden rooms. 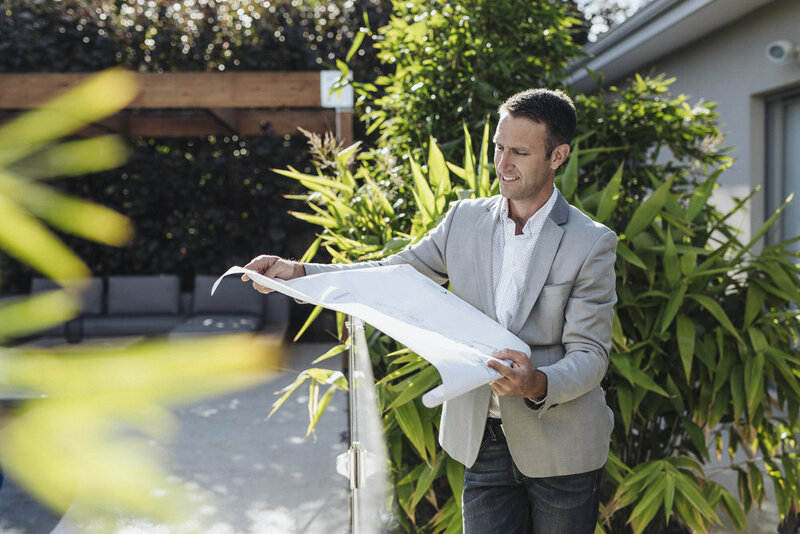 Residential landscapers need to get a thorough understanding of a site (and how it works with regards to orientation, solar access, proximity to neighbours, privacy and noise) before they start on a project. The best landscapes are those that are adaptable and provide opportunity for multiple forms of use. It is good to design spaces that form a balance between static architectural control and comfort with the wild and ever changing dynamic of the landscape. By adding partitions or vertical elements that divide space, you can create separate garden rooms. Although this effectively divides a larger space into smaller, it creates a feeling of a larger complete space by hiding and revealing these spaces when someone travels through the garden. Often the dividing wall can have a degree of permeability whether it is through the material selection or with the inclusion of an opening to provide glimpses to spaces beyond which creates a feeling of 'wanting to discover what is around the corner'. A level change can help to clearly define space in a landscape and enhance a sense of moving from one space to another. Designing space in the landscape is no different to designing space within a home. A room's function is greatly influenced by the distance between the walls that contain it. It is much the same for external 'garden rooms'. For example, a quiet space for sitting and reading a book will always feel more enticing when it's in a cozy, smaller space, at a 'human' scale and tucked away. Having materials that are common with the building creates a sense that the garden is a continuation of that architectural language and can continue a sense of moving through rooms. Understanding foreground, middle ground and background in a landscape can help create openness and enclosure. A well placed ornament or feature that draws the eye to the back of a garden can exemplify the feeling of space and openness. In contrast, a lush vertical garden wall in a small space can create a feeling of enclosure. Utilizing neighbouring views, trees etc can add to your own garden ambience or greenery without having to plant your own and take up valuable space in a small garden. This helps to create a lush feeling within a small space, whilst also changing the scale of small area, helping it to feel larger. It can also help to blur the garden boundary between one property and the next, making your space seem larger than it actually is. Choose foliage and textural plants that are attractive year round, and do not require constant feeling and deadheading like most seasonal flowers do. This will help ensure your garden doesn’t have an unattractive ‘dead spot’ during certain times of the year. If you are thinking of re-designing your garden, please feel free to contact Phase3. We are pleased to announce that the Town of Cambridge awarded Phase3 the contract for building and constructing a new picnic & playground area at the Wembley Athletics Centre. We are delighted to be involved in another project that creates a fun place for kids to play. We have successfully built a number of ‘destination playgrounds’ around Perth and love seeing the transformative effect an adventure playground can have on the local and surrounding communities. Exciting new job openings at Phase3 Landscape Construction! Due to sustained strategic growth within our commercial operations, we have new openings for both Contracts Administrators and Project Managers. These are growth positions and we are will consider both junior and senior applicants of both roles. We have just finished WGV and it looks great! Facilities included public toilets, seating areas, BBQ and picnic areas. Great for families. WGV is WA's first One Planet Community. "It demonstrates the very best in modern, sustainable design and hope to create a community where it is easy and affordable for people to live in a way that makes smart use of the earth's resources" Landcorp. Phase3 were involved in the construction of the public space in and around Sullivan Hall on the WGV Estate. The WGV estate has so far received two prestigious Planning Institute of Australia awards for excellence; Best Planning Ideas - Small Project (WA) and the Planning Minister's Award. For more information on this project please visit this article by Josh Byrne. Venue address: Cnr Nannine & Stevens Street White Gum Valley. For directions on how to get there please visit this Map. Our latest Phase3 residential project was recently featured in The West's 'New Homes' lift-out. Thanks to reporter Maureen Eppen for her words below. 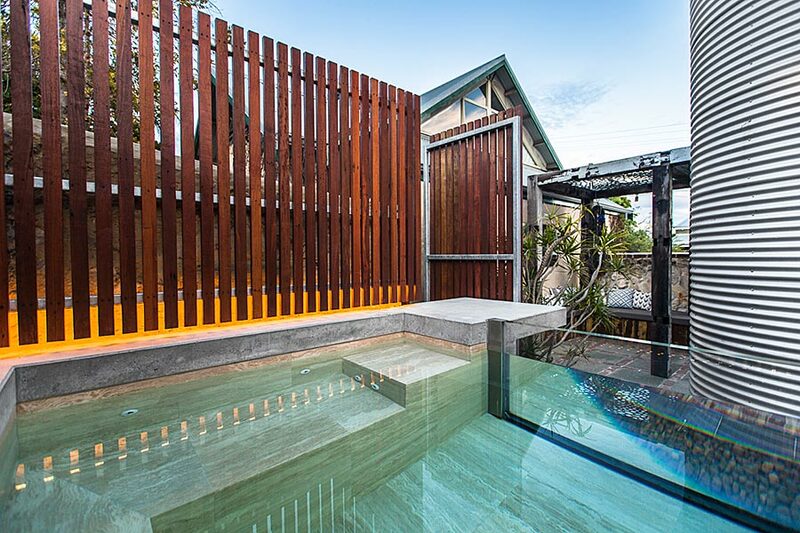 'Working in an area of less than 40sqm, Phase3 Landscape Construction used a mix of recycled and new materials to create a striking plunge pool and outdoor living space in North Fremantle. Senior Designer Matt Gee said the brief was to improve functionality for the poorly configured backyard by introducing a plunge pool, pergola and outdoor seating area, combining elegant design and high-spec elements and rustic finishes. The focal point is the 2m x 2.2m, 1.2m-deep plunge pool and spa, which is tiled in travertine and incorporates a clear front panel of 70mm perspex. An off-form floating staircase provides access to the pool, framed by custom steel and timber screens. "Space for the pool was always going to be inherently tight, and a pool window was a key feature to visually enhance the pool and volume of water", Mr Gee said. If you are interested in starting a project with Phase3, please visit our "START YOUR PROJECT" page. Kinkuna Park Adventure Playground opens! Photo credit: Lorraine, Buggy Buddys. Scroll down to watch video. Announcing the opening of Kinkuna Park Adventure Playground, a project we have recently completed for Satterley at the new Allara Estate in Eglington! Included in the playground are mini sunken floor trampolines, rope bridges, balance ropes, climbing walls, and a basketball hoop. Emerge Associates have designed a playspace to suit all ages, even adults! BBQ facilities and automated toilets are included and only 20 minutes from Joondalup. To see some great photo's of the playground please visit Buggy Buddys, a free online guide for familys. We’re huge fans of sustainable design so are incredibly excited to have won the tender, in partnership with Josh Byrne and Associates, for LandCorp’s WGV Sustainable Living Residential Project! This new residential precinct will demonstrate how compact, sustainable design can be used to create attractive, affordable homes that incorporate environmental, energy and water saving initiatives. This will be WA’s first ‘One Planet Living’ community, and is based in White Gum Valley. The L-shaped pool (and its many variations) is probably the most popular type of purpose built concrete swimming pool, as it offers the best of two worlds. It’s long enough to incorporate a lap pool but has the added width to accommodate a shallow area for the kids or a relaxation corner that overlooks the pool and garden. Your choice of edge treatments can further add to the variety of looks achievable with an L-shaped pool, as these two images depict. A flat concrete edge fits seamlessly into the surrounding landscape, while a defined edge lends itself to incorporating water features or feature walls. The beauty of choosing an L-shaped pool is that you can choose the configuration that best suits your space. Geometric shaped concrete swimming pools come in a variety of styles and can be designed to match the tone of your home. Whether your style is minimalist, contemporary, natural or freeform, there’s a geometric shaped pool to suit. Geometric pools can be designed to be built 1200mm above ground, which provides an opportunity to use the pool edge as a safety barrier, avoiding the need for a separate pool fence. Modern in shape, the classic geometric pool fits with all styles of home, and transition easily with changes of pool surroundings. Minimalist, contemporary, natural and freeform styles can all be expressed around this pool shape. As the name suggests, a wide lap pool is ideal for exercise and fitness. A recreation area can be incorporated by including steps along the short edge, or a wide step along one side, as shown in this image. The plunge pool has had a huge rise in popularity in recent years. A modern twist on the geometric shape, the plunge pool tends to be smaller, deeper, and less high maintenance than a traditional concrete swimming pool. Because of its smaller size, choosing a plunge pool over a larger pool often allows a bit of extra budget to go towards finishes. Glass façades or pool ‘windows’, travertine or granite mosaic tiling, spa jets and water features are all popular additions to plunge pools. Figure 8 and freeform concrete swimming pools combine organic shapes with retro modern styling. Evocative of a tropical oasis, the curved lines of a figure 8 pool allow for vegetation to be brought right up to the edges, creating a lush, natural environment. For families with younger children, the figure 8 shape is the shape that most clearly distinguishes the shallow end from the deep end. As you can see, there are a vast range of styles that can be achieved with a custom designed concrete swimming pool. Whatever your requirements, our designers can help you create a beautiful and functional pool that works best for your space. The humble swimming pool takes its place at one of the most prestigious institutions in the world. We were thrilled to see that The Pool, an exhibition that explores the history of the swimming pool and its role in Australian society, has been chosen to represent Australia in the 2016 Venice Architecture Biennale. Especially inspiring was this quote, from the creators of the entry. Inspired by this celebration of an iconic part of the Australian lifestyle, we thought we’d share with you some of Phase 3’s design guidelines on how to create a swimming pool of perfect proportions. While north or east positioning ensures maximum sunlight, the size and shape of your space also plays a big part in designing a swimming pool that works for you. Bigger isn’t always better – it’s important to have a pool that complements your space, not dominates it. Take plunge pools – their size, versatility and ability to suit a variety of budgets has seen them become a popular alternative to traditional swimming pools. And as an added bonus, they can make you feel like you’re on a tropical holiday in a luxury villa! A custom concrete pool is another great option that allows you the flexibility to create something specifically tailored to the space you have. Your outdoor living space is so much more than just a swimming pool – it’s an extension of your home and a reflection of your personal style. A well designed outdoor space creates a seamless flow from your house to your pool, using materials and textures that generate harmony between inside and out. Traditional styles of pool fencing have taken a back seat to more modern, visually appealing options, which can transform your space while still adhering to Australian safety standards. Bamboo, plants and other natural elements can be used to perfectly frame your pool and create a beautiful and natural setting. What does your swimming pool mean to you? Is it your retreat – somewhere to relax and unwind at the end of a busy day? Is it a place to entertain friends while you cook them a beautiful meal in your outdoor kitchen? Or a space to play and connect with family? Whatever it means to you, there are countless ways to customise your swimming pool and surrounds to reflect what’s important to you. From water features, lighting, and wireless outdoor entertainment to seating, shade and shelter – even outdoor showers. A well designed outdoor space is the perfect way to experience beauty and wonder, right in your own back yard.